I got this book a few weeks ago, but I still haven’t found the time to sit down with it. So this post will just be my first impression and some facts about the book. 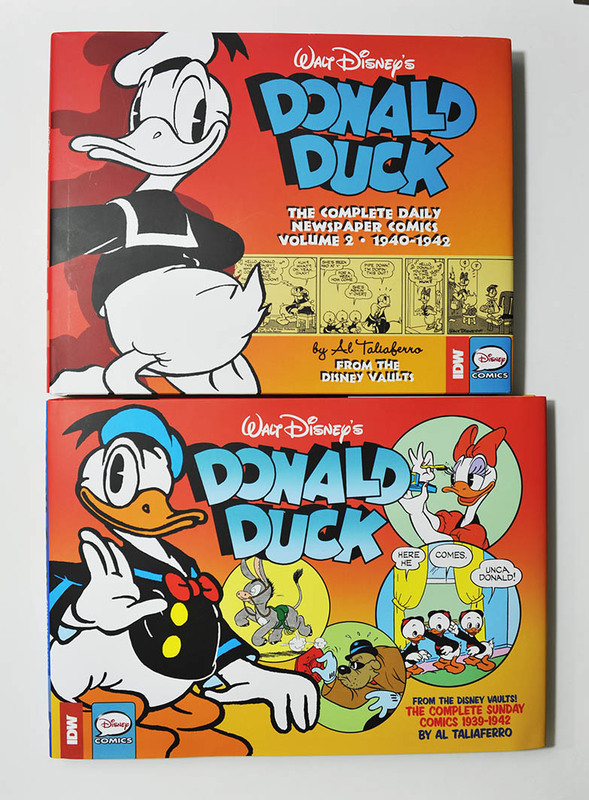 The first volume collects all Sunday pages with Donald Duck from December 10, 1939 to December 27, 1942. So roughly 3 years of Sunday pages and a total of 160 pages of comics. In addition we get an intro article by Niels Houlberg Hansen. Before Donald got his own series of Sunday pages, he appeared in the Sunday serial The Wise Little Hen (1934) and 67 Sunday pages in 1937-1938. 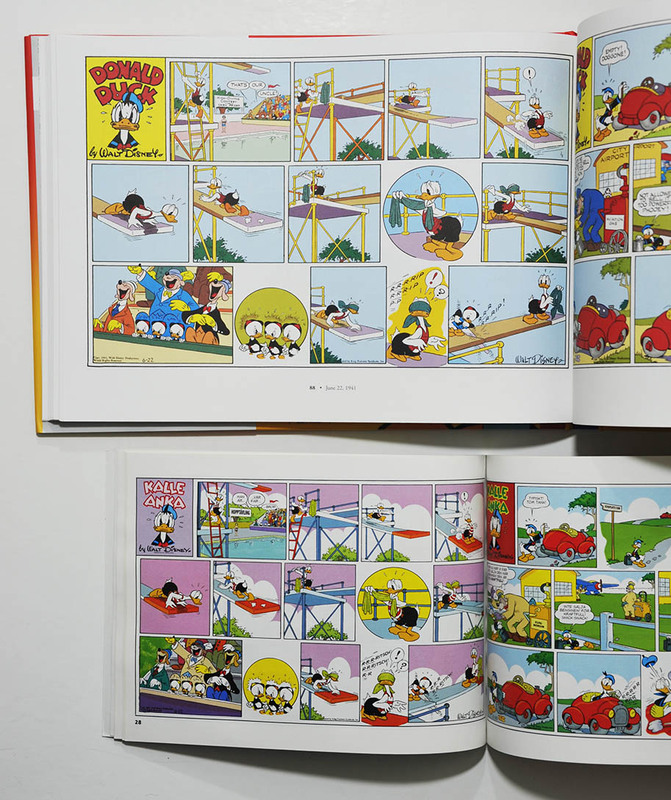 They were all printed under the Silly Symphony logo and are not included in this book. Instead we can find them in the first and second volume of IDW's Silly Symphonies collection, where the first volume will be on sale next month. 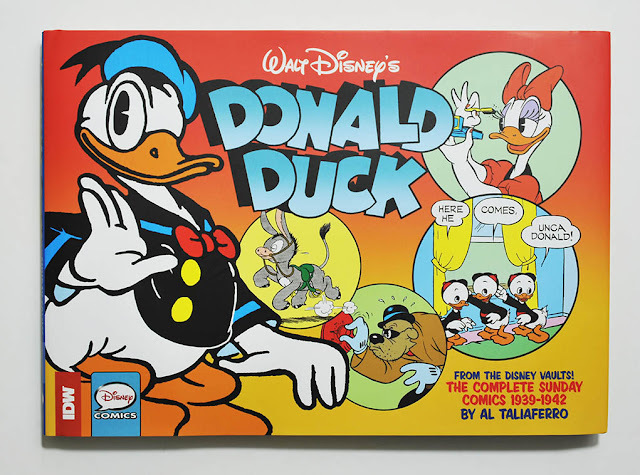 Donald also had some guest appearances in the Mickey Mouse Sunday comics, they can all be found it the two volumes of Mickey Mouse Color Sundays as part of Fantagraphics' Floyd Gottfredson collection. Compared to the Donald Duck Daily Strip collection, this book has fewer pages and is more expensive. 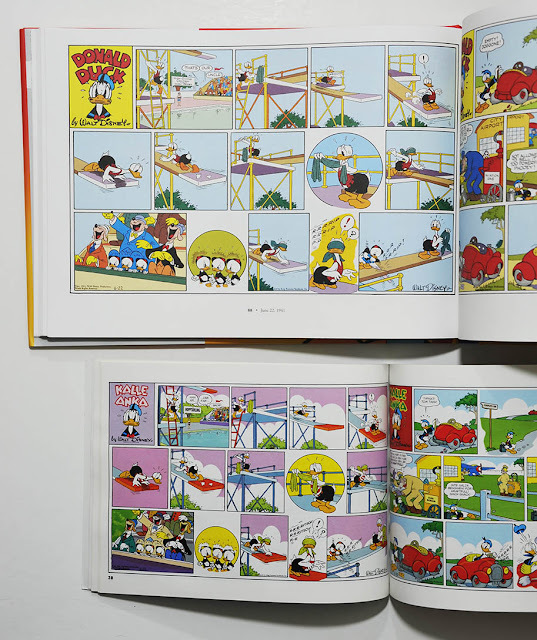 But all pages are colored using old file copies as a color guide – where the daily strip collection is in black and white. So I assume there’s a lot more work involved putting this book together, making it a bit more expensive. The Sunday collection is also a bit wider. But both collections have the same height, so they look great together on the shelf. My first impression of this book (and series) is really great! Everything from the source material used, paper, printing and binding are all good. And I think the size is perfect. By using the original colors as a color guide we get some weird looking colors now and then, like Gus Goose being all gray. But it’s also interesting to see how the original coloring was – so I don’t mind that. I’ve seen comments from people that prefer the daily strips and the Sunday pages to be printed together in the same book. Personally I think the books are better by separating the dailies and Sunday pages like IDW does. 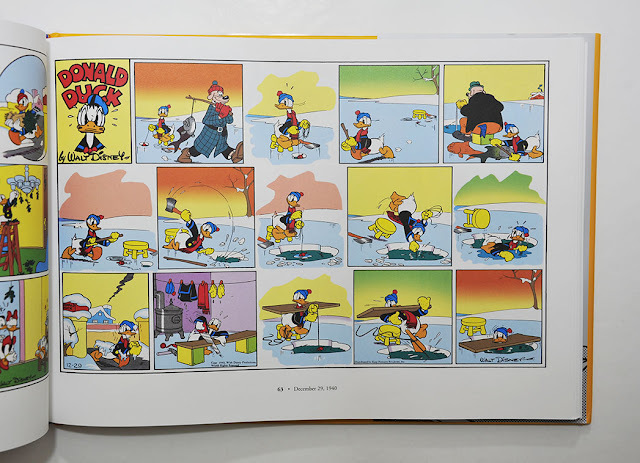 A lot of the Sunday comics in this book have been published as 1-pagers in various Disney comics, but then some of the panels are usually cut. Sunday pages are also designed so they can be cut and printed in different layouts, so even if you’re a collector of newspaper clippings it’s hard to find complete copies. All pages in this book however are in the complete full format. And the same page in the IDW book. A few years ago they stared publishing the Donald Duck Sunday pages chronologically in the Swedish Kalle Anka Christmas album. I planned on collecting this series as I wanted to have the pages chronologically. But they were such a pain trying to get hold of. Now that IDW started a much better collection I don’t have to track down the Swedish comics anymore. "I’ve seen comments from people that prefer the daily strips and the Sunday pages to be printed together in the same book. 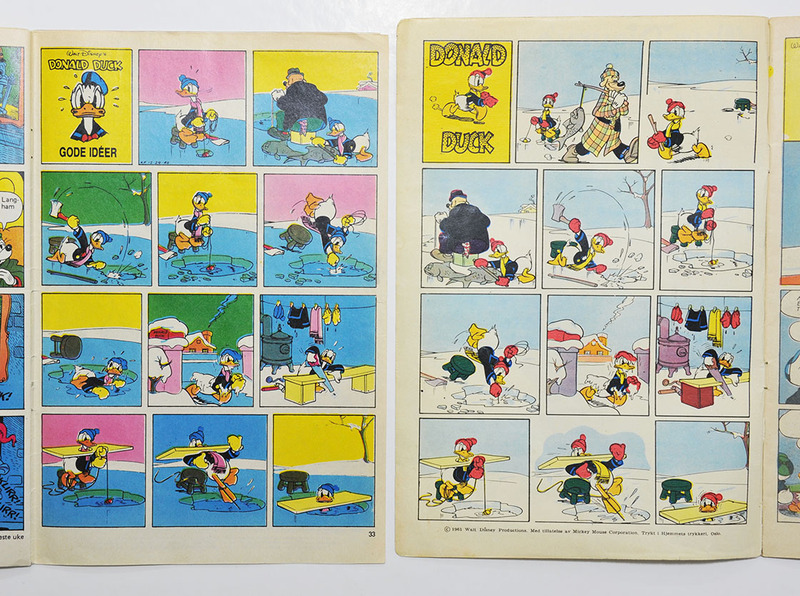 Personally I think the books are better by separating the dailies and Sunday pages like IDW does": I was the one who made that comment, and I still think it would be better to follow the development of newspaper comics by printing daily strips and Sunday pages together, and even better if "The Wise Little Hen" and the 67 Donald Duck Sunday pages from 1937-1938 (which include the debut of Huey, Dewey and Louie) were also included. Anyway, the important thing is that the stories are somehow printed.